When Shakespeare wrote the line "...such stuff as dreams are made on", 'stuff' meant fabric. Indeed, in Danish, 'stof' is just that, fabric. I've been wondering about these bicycle helmets on the market that are covered in fabric or even leather. Are they more dangerous than other kinds of bike helmets? I'm sure we can agree that one of the basic, important qualities of a helmet is that it's slippery. If you're a helmet-wearer and your head strikes asphalt - which is never a smooth surface - I'm sure you'd rather have your helmet slide along the asphalt, as opposed to snagging. That wouldn't be very good for your neck. While cycling is fantastically safe, most serious head injuries are the result of so-called angular or rotational acceleration, which leads to diffuse axonal injury (DAI) and subdural haematoma (SDH). These are the most common causes of brain injury in all traffic accidents. Minor injuries are usally the result of linear acceleration. A straight-forward impact without any rotation. Modern bicycle helmets are only tested for linear impacts and have little effect in preventing rotational ones. In the tests they are dropped straight down onto a flat or slightly-rounded surface from a height that is roughly the same as a cyclist's or pedestrian's head. They simulate a speed of about 20 km/h. They are only tested for impact on the top of the helmet, not the sides or front or back. A vertical fall. They aren't tested for an oblique, or angled, fall which is the most common type. Nor are they tested with a anything that resembles a human body and all the forces that are involved with many kilograms of body attached to a helmet or impact with a car. There are even studies that suggest that risk of rotational injury is higher with a helmet on. In other words, even low-speed lateral forces can be converted to the far more dangerous rotational forces. Wikipedia has lots of links about it, and the Bicycle Helmet Research Foundation has a page. Anyway, I was wondering if there was any tests or research done on these new fabric-covered helmets but I have been unable to find any evidence that there is. Landing obliquely on asphalt at any speed is like landing on sandpaper. Racing cyclists shave their arms and legs in order to reduce this sandpapery friction and thereby reduce the severity of road rash caused when body hair slides along asphalt. The same principle applies to ventilation holes on a helmet as well as to fabric on a helmet. Surely the one thing we can all agree on is that a helmet should be slippery. Even if these fabric covers are easily detachable it certainly seems to be an unecessary risk to run - increasing the chance of having your head snagging on asphalt. 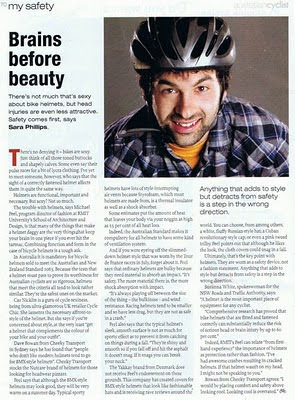 In the midst of my checking around, I recieved an article from a reader out of Australian Cyclist - a lycra mag from Down Under. They expressed much the same concerns about fabric snagging on asphalt and basically dissed the concept. The Yakkay brand from Denmark does not meet Peel's endorsement on these grounds. This company has created covers for BMX-style helmets that look like fashionable hats and is recieving rave reviews around the world. Peel points out that while he likes the look, the cloth covers could snag in a fall. Ultimately that's the key point with helmets. They are worn as a safety device, not a fashion statement. Anything that adds to style but detracts from safety is a step in the wrong direction." I've even seen helmets on the market covered with leather, which would seem even more risky than fabric. I recall hearing that some 'stylish' helmets produced for the City of New York featured fabric but the city couldn't get them insured so they were dropped. I've recently learned that a helmet manufacturer, Giro, made a soft-shell helmet that came with a helmet cover. This was in the early 1990's. They were taken off the market because, among other reasons, the higher risk of neck injury and brain injury caused by the snagging of the fabric on the asphalt. I think that if companies that produce fabric-covered helmets should be required to produced comprehensive evidence from laboratory tests that show without a doubt that they do not increase the already worrying risk of brain injury. Marketing or fact? Who knows. I'm not in the market for a helmet so it doesn't matter much. But if were a helmet-wearer I'd stick, at the very least, to smooth and shiny plastic outer layer and not many ventilation holes.